Sabato 8 giugno alle ore 17 l’appuntamento con Paola De Pietri per la presentazione di To Face, il suo ultimo libro edito da Steidl. L’evento, ad ingresso libero, è il primo di una selezione di incontri con artisti che presenteranno le loro pubblicazioni presso il Bookshop di Fondazione Fotografia Modena. A seguire book signing con l’artista. 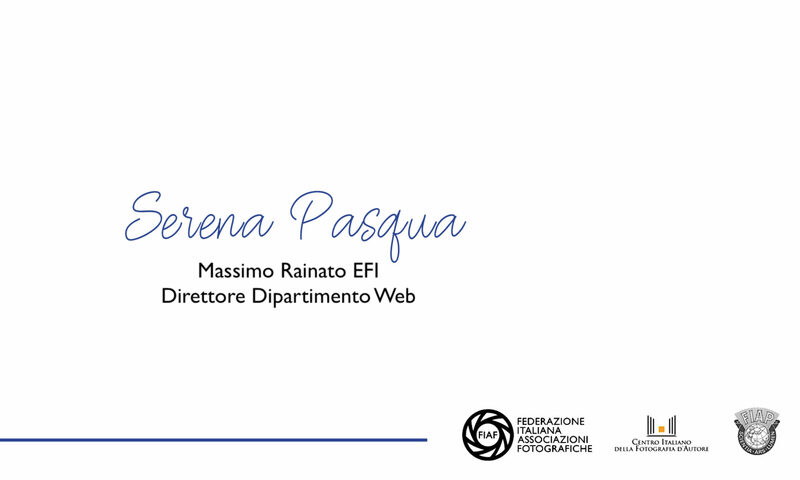 L’incontro si inserisce inoltre all’interno della rassegna Musei da Gustare, promossa dalla Provincia di Modena. Per l’occasione l’ingresso alle mostre Three True Stories e Il Cantiere della Cultura sarà gratuito durante tutto il fine settimana dell’8 e 9 giugno. Giovedì 6 giugno – Verrà a trovarci Emanuele Fusco dell’Eikon con una serie di lavori. Due mostre dal titolo “…altre storie” e “Sguardi sul paesaggio”, e due audiovisivi dal titolo “Per te” e “Le spiagge della libertà”. Giovedì13 giugno – Un grande ritorno dell’Amico e Socio Subalpino Giorgio Boschetti. Coerentemente con l’evoluzione artistica a cui Giorgio ci ha abituato, ci presenterà un’opera dal titolo: DENTRO L’ANIMA. Un tema intimista che ci permetterà di evidenziare un aspetto meno conosciuto dell’autore. Una serie di immagini per stampa e una proiezione multimediale con l’ausilio di una musicista saranno il biglietto da visita che accoglierà i nostri ospiti. Giovedì 27 giugno – quinta serata di Fotocampionato dal tema: Parchi e Giardini. Siamo lieti di comunicarvi che giovedì 4 luglio ci sarà la consueta cena sociale organizzata dalla Società Fotografica Subalpina: quest’anno si terrà vicino alla nostra sede, presso il Ristorante Pizzeria Tre da Tre di Via Verdi 33 Torino. Maggiori dettagli inerenti al menù e al costo verranno divulgati con una email dedicata. Olympus introduced the first Pen ‘Mini’, the E-PM1 in late 2011. Where most interchangeable lens cameras fall somewhere on the spectrum between a point-and-shoot and a full-fledged DSLR, the E-PM1 skewed decidedly toward the compact camera side of the scale. Unlike its Digital PEN predecessors, it offered no external mode dial and relatively few physical controls, exchanging these features for the smallest and lightest footprint of any Olympus ILC. The Olympus E-PM2 follows suit, building on the previous model’s specs by adding a 3.0 inch touch screen, two more buttons and a small built-in grip on the front panel. 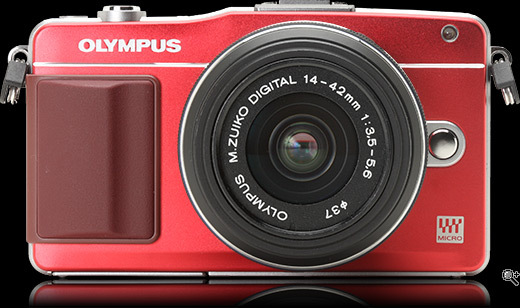 It shares the same essential ‘guts’ with the Olympus E-PL5, which was introduced at the same time. via Olympus PEN E-PM2 Review: Digital Photography Review. Nikon offers several wide-angle zoom lenses. Most of these target professional users and consequently delivery fery good if not exceptional performance. However, these lenses are also quite expensive and because of that usually not an option for amateurs. There is an affordable Nikon wide zoom, though, the Nikkor AF-D 18-35mm f/3.5-4.5. Unfortunately, this lens looks a little outdated today (for example due to the lack of AF-S) and, what’s maybe more important, it shows rather mediocre performance on modern digital FX cameras. So, with the D600 now expanding Nikon’s FX camera portfolio into the consumer segment, the pressure raised to update this lens and offer a modern and attractive wide angle zoom for current or future FX users. 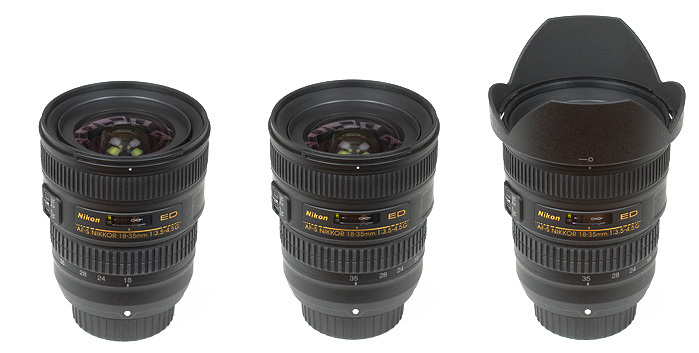 As a result, the Nikkor AF-S 18-35mm f/3.5-4.5 G ED, was announced in January 2013. It offers a modern silent-wave AF drive and an update optical construction, now featuring 2 ED and 3 aspherical elements. Let’s have a look at how the lens performs on our current FX test camera, the Nikon D3x. viaNikkor AF-S 18-35mm f/3.5-4.5 G ED (FX) – Review / Test Report. 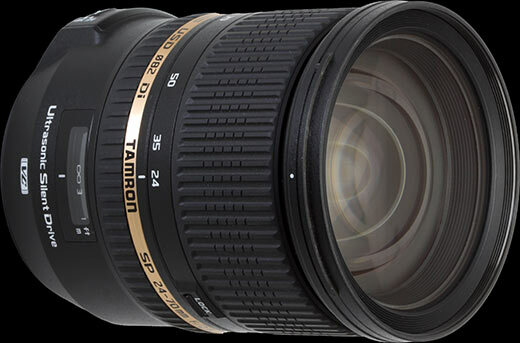 The Tamron SP 24-70mm F/2.8 Di VC USD (Model A007) was announced in February 2012, just one day before the Canon EF 24-70mm f/2.8L II USM. Its headline feature is indicated by the ‘VC’ in its name, which stands for ‘Vibration Control’; it’s the first and only optically-stabilized fast normal zoom for full frame cameras. As befits a premium SLR lens it also includes an ultrasonic-type autofocus motor for fast and silent focusing, and as an added bonus it features a degree of weathersealing (Tamron uses the term ‘drip proof’). Put together, this makes it the highest-specified 24-70mm lens currently on the market. To achieve this feat, Tamron has employed an exotic optical formula that makes extensive use of special elements. It includes three Low Dispersion (LD) glass elements, two Extra Refractive Index (XR) glass elements, three glass molded aspheric elements, and one hybrid aspherical element in its 17 element / 12 group design. A 9-bladed aperture diaphragm uses curved blades for the attractive rendition of out-of-focus backgrounds. As usual for Tamron the lens is available in versions for Canon, Nikon and Sony SLRs. The latter doesn’t include optical stabilization, relying instead on the camera body’s built-in sensor-shift stabilization, and drops the ‘VC’ from its name as a result. But in all other respects it’s identical, including the same optical design. What’s perhaps most impressive about the 24-70mm F2.8 VC, though, is its price. At around $1300/£800 it’s significantly cheaper than Canon, Nikon and Sony’s own 24-70mm F2.8 lenses, although it’s rather more expensive than Sigma’s older, unstabilized model. You could be forgiven for thinking this is too good to be true – on paper it looks like a steal. So the question is: how well does it work in practical use? Read on to find out. viaTamron SP 24-70mm F/2.8 Di VC USD review: Digital Photography Review. As Nikon’s ‘advanced beginner’ DSLR, the D5200 sits between the entry-level D3200 and the enthusiast-targeted D7100 in the company’s most recent APS-C lineup. The D5200 offers 24MP resolution (like its APS-C stablemates), an articulated rear LCD and more physical controls than the D3200, but without the twin-dial interface and professional grade AF system of the decidedly higher market (and much more customizeable) D7100. On the outside, the D5200 is virtually identical to its predecessor, the D5100, with external changes limited to a dedicated drive mode button on the D5200’s top plate, stereo microphone grills atop the pentamirror – like on the Canon EOS 650D – and a slightly redesigned rear multi selector. 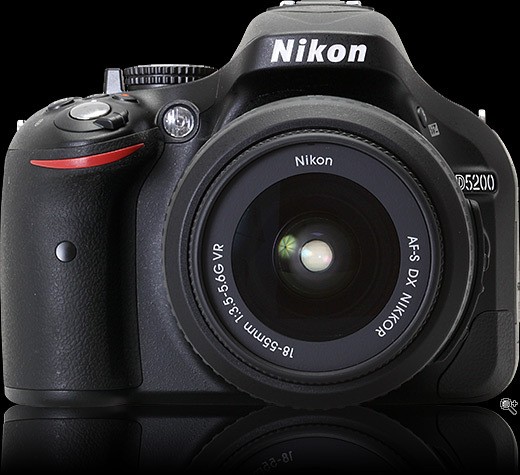 The D5200’s more significant upgrades lie ‘under the hood’. Impressively, many of these are inherited from higher-end Nikon DSLRs, including a 39-point AF system with 9 cross-type sensors and ample frame coverage, and a 2016 pixel RGB color-sensitive metering sensor, both taken from the D7000. The D5200 borrows from the D7100 a well-implemented Auto ISO feature that is tied to the lens’ current focal length. Although the D5200 shares the same 24MP resolution as both the D3200 and D7100, the D5200 offers a higher extended ISO range compared to the D3200 (25600 vs 12800) and faster continuous shooting (5 fps vs 4). And the D5200, unlike the D7100, continues to use an anti-aliasing (AA) filter, although as we demonstrated in a side by side comparison in our D7100 review, it gives up precious little in terms of detail to its more expensive big brother. For video shooters, the D5200 can record Full HD 1920 x 1080 movies at up to 60i or 50i (when set to NTSC and PAL respectively), although this uses a central crop of the sensor area. More conventional 30p, 25p and 24p modes use the full width of the sensor. In manual mode you have the option to take limited control of both shutter speed and ISO, but not aperture. And a stereo sound meter lets you adjust the level of either the built-in or or external mic, such as the optional ME-1 stereo mics. viaNikon D5200 In-Depth Review: Digital Photography Review.